"PFRPG" redirects here. For the game produced by Palladium Books, see Palladium Fantasy Role-Playing Game. The Pathfinder Roleplaying Game is a fantasy role-playing game (RPG) that was published in 2009 by Paizo Publishing. It extends and modifies the System Reference Document (SRD) based on the revised 3rd edition Dungeons & Dragons (D&D) published by Wizards of the Coast under the Open Game License (OGL), and is intended to be backward-compatible with that edition. Pathfinder is supported by the official Pathfinder periodicals and various third-party content created to be compatible with the game. Beginning in 2002, Paizo took over publishing Dragon and Dungeon magazines, which were about the Dungeons & Dragons (D&D) role-playing game, under contract to D&D publishers Wizards of the Coast. Wizards of the Coast chose not to renew the contract in early 2007, and Paizo began publishing the Pathfinder periodical line as a replacement. In August 2007, Wizards of the Coast announced the pending release of the 4th edition of D&D, which replaced version 3.5. Many of the staff at Paizo were concerned about the more restrictive Game System License the 4th edition was being released under. Instead of continuing to support D&D, Paizo released the stand-alone Pathfinder Roleplaying Game as a modified version of the version 3.5 game, under the Open Game License used by the older version. Announced in March 2008, Pathfinder was designed over the course of a year using an open playtest model, where players could try the system and post their feedback on Paizo's website. Paizo announced a second edition of Pathfinder in 2018. Like the first edition, there will be an open playtest. In May 2018, Paizo announced it was working on Pathfinder Second Edition to refine elements of the rule set to reflect feedback and clarification on the original system over the prior years. Part of the changes planned is to simplify a player's turn during a round of combat to make it easier to allow more complex in-game actions to be taken. They also want to revise the rules around magic items to encourage players to seek more powerful items by limiting how many items they can carry. The preliminary ruleset was published in August 2018 as Pathfinder Playtest so that players can test out and provide feedback, and with plans to publish the full Second Edition in 2019. Paizo publishes a line of novels, Pathfinder Tales, based in the Pathfinder setting. The first book, Prince of Wolves, was released in 2010 and was written by Dave Gross, former editor of Dragon Magazine. Other titles in the series, which numbers over 30 books, include City of the Fallen Sky by Tim Pratt, Winter Witch by Elaine Cunningham, The Wizard's Mask by Ed Greenwood, and Death's Heretic by line editor James L. Sutter. A line of gaming miniatures, Pathfinder Battles, is produced by Wizkids. A card game based on the role-playing game, the Pathfinder Adventure Card Game, was released at Gen Con 2013. It was designed by Mike Selinker of Lone Shark Games. The initial set for the game, Rise of the Runelords, was followed by the expansions Skull and Shackles and Wrath of the Righteous. Big Finish Productions has produced a series of audio dramas based on the Pathfinder setting. Dynamite Entertainment has also produced a line of Pathfinder comic books, including a spin-off title, Pathfinder: Goblins, as well as Pathfinder: Worldscape, which also featured characters such as Red Sonja, Tarzan and John Carter. A computer game adaptation of the Pathfinder universe, Pathfinder Online, was launched on November 27, 2012 by Goblin Works and Paizo and was successful in attracting Kickstarter crowdfunding in 2013 to finance its development. An official alpha test was announced in late June 2014. Early enrollment was announced on July 29, 2015. On May 17, 2017, another video game, Pathfinder: Kingmaker, was announced by Paizo and developer Owlcat Games. An accompanying Kickstarter campaign was launched in June 2017. The game was released on September 25, 2018. ^ "'Dragon' and 'Dungeon' Magazines to End Paizo Launching 'Pathfinder'". ICv2.com. April 20, 2007. Retrieved October 2, 2013. ^ a b Tito, Greg (December 28, 2011). "The State of D&D: Present". The Escapist. Retrieved October 1, 2013. ^ LaSala, Jeff (March 25, 2008). "7 Role-Playing Games You Should Play on International TableTop Day". Geek O System. Geekosystem, LLC. Retrieved April 10, 2018. ^ Baichtal, John (March 25, 2008). "No D&D 4E for Paizo?!?". Wired.com. Conde Nast. Retrieved October 1, 2013. ^ "Welcome to the Pathfinder Roleplaying Game!". April 11, 2014. Retrieved April 17, 2014. ^ "Top 5 RPGs—Q2 2011". IcV2. August 4, 2011. Retrieved October 2, 2013. ^ "Top 5 RPGs—Fall 2013". IcV2. March 13, 2014. Retrieved April 16, 2014. ^ "Top 5 RPGs—Fall 2012". IcV2. March 29, 2012. Retrieved October 2, 2013. ^ "Top 5 RPGs—Spring 2013". IcV2. July 15, 2013. Retrieved October 2, 2013. ^ Forbing, Jeremy (December 22, 2013). "Dungeons & Dragons Next Edition Out Summer 2014". Guardian Liberty Voice. Retrieved April 16, 2014. ^ "2013 nominees and winners". ENnies. August 17, 2013. Retrieved October 2, 2013. ^ "2010 nominees and winners". ENnies. Retrieved October 2, 2013. ^ Lafayette, Lev (October 23, 2007). "Review of Pathfinder Beta". RPGnet d20. Retrieved July 23, 2010. ^ Bonanno, Janelle (March 28, 2013). "Put More Pirates in Your Pathfinder With Freeport". The Escapist. Retrieved April 17, 2014. ^ a b LaSala, Jeff (March 29, 2013), "7 Role-Playing Games You Should Play on International TableTop Day", Geek O System, Geekosystem, LLC, retrieved April 13, 2013. ^ Hall, Charlie (May 10, 2018). "Pathfinder, with roots in a decades-old strain of D&D, is launching a second edition". Polygon. Retrieved May 10, 2018. ^ a b "Pathfinder Roleplaying game: Here be monsters". Deseret News. May 8, 2015. Retrieved August 4, 2015. ^ Appelcline, Shannon (2014). Designers & Dragons: The '00s. Evil Hat Productions. p. 224. ISBN 9781613170878. ^ "Pathfinder Roleplaying Game: Advanced Player's Guide (OGL)". Paizo Publishing. Retrieved July 13, 2015. ^ "D&D Knights Help Oklahoma Tornado Victims". io9. May 29, 2013. Retrieved July 14, 2015. ^ "'Pathfinder' fantasy roleplaying adventure is fun, exciting". Deseret News. March 26, 2015. Retrieved August 4, 2015. ^ "Pathfinder Advanced Class Guide: How the classes stack up (Part 1)". denverpost.com. July 8, 2014. Retrieved July 13, 2015. ^ "Pathfinder Unchained Lets You Hack Your Tabletop Roleplaying Campaign". The Escapist. April 30, 2015. Retrieved August 24, 2015. ^ "Pathfinder role-playing game: Unchained review". Deseret News. August 20, 2015. Retrieved August 24, 2015. ^ "The Good, the Bad, and the Ugly of Pathfinder's Advanced Race Guide". tor.com. June 21, 2012. Retrieved July 13, 2015. ^ "How Mythic Adventures Massively Raises the Stakes for Pathfinder". io9.com. December 23, 2013. Retrieved July 13, 2015. ^ a b Appelcline, Shannon (2014). Designers & Dragons: The '00s. Evil Hat Productions. p. 228. ISBN 9781613170878. ^ "Pathfinder Tales: City of the Fallen Sky". Retrieved August 4, 2015. ^ a b Reid, Calvin (November 29, 2013). "Paizo's Magical Realm of RPG Publishing". Publishers Weekly. Retrieved August 4, 2015. ^ Bolding, Jonathon (April 12, 2014). "Pathfinder Adventure Card Game Organized Play, Individual Decks Revealed". The Escapist. Retrieved April 17, 2014. ^ Morgenegg, Ryan (May 27, 2015). "Pathfinder Adventure card game review: Wrath of the Righteous". Deseret News. Retrieved August 4, 2015. ^ "Best Shots Advance Reviews: SATELLITE SAM #2, PATHFINDER: GOBLINS! #1". Newsarama. August 6, 2013. Retrieved August 2, 2015. ^ Erik Kain (December 13, 2012). "A Brief Look At The 'Pathfinder Online' Sandbox MMO On Kickstarter". Forbes. ^ "Pathfinder Online: A Fantasy Sandbox MMO". Kickstarter. Retrieved October 2, 2015. ^ Matt Daniel (January 14, 2013). "Pathfinder Online Kickstarter now successfully funded [Updated]". Massively. ^ Ryan Dancey (June 26, 2014). "Aaaaaaaaand Away We Go!". Goblin Works. ^ "Pathfinder Online: A Fantasy Sandbox MMO". Kickstarter. Retrieved October 1, 2015. ^ O'Connor, Alice (May 17, 2017). "Pathfinder: Kingmaker bringing tabletop RPG to PC". Rock, Paper, Shotgun. Retrieved August 26, 2017. ^ Wilson, Jason (May 31, 2017). "Pathfinder: Kingmaker launches $500,000 Kickstarter for extra content, not the base game (update)". GamesBeat. VentureBeat. Retrieved August 26, 2017. ^ "Kickstarter-Pathfinder: Kingmaker". Retrieved December 19, 2018. ^ "Pathfinder: Kingmaker on Steam". Retrieved December 19, 2018. 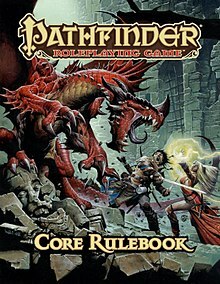 Wikimedia Commons has media related to Pathfinder Roleplaying Game.